We are pleased to announce the promotion of Kanoungnit Thongpunparn to Director of Sales – Bangkok. Known by her nickname, Nicky, she has been working with us in our head office in Bangkok for nine years and in the travel industry for over 18 years. She has experience in airline ticketing and reservations, leading private tour groups and as a luxury travel designer. She has worked with us as a sales manager and in the last few years has been instrumental in developing and growing the Style by ICS product. Commenting on the new appointment, Sandor Levai, CEO, said “Nicky’s in-depth knowledge of ICS Travel Group and the Asia Pacific region, together with her energy and experience will be crucial in helping to meet our growing demands in Asia”. Born and brought up in Thailand, Nicky is fluent in English and Thai. An avid traveller, she has explored more than 50 of the world’s most exotic destinations. 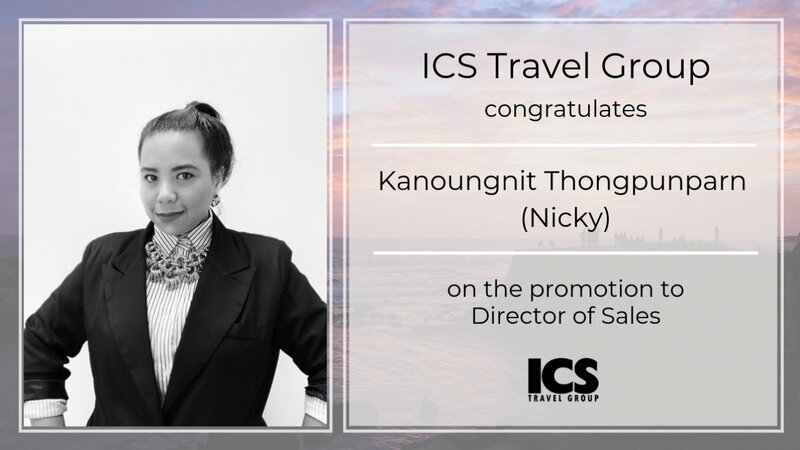 Please join us in congratulating Nicky on her new position in ICS Travel Group!